A tasty rockfish at SIO's Birch Aq. The more you look, the more there is to see. This certainly applies to the myriad possibilities of marine aquarium systems possible to us as aquarists. Biotopes of varying current, lighting, food-availability-make-up; specialty tanks emphasizing one species or a group like SPS or Leather Corals; full-on breeding rigs for producing specific algae, invertebrates and fishes Whats often left out of discussion are non-tropical possibilities; yes, cool to cold-water set-ups. After all, the majority of the worlds oceans are decidedly NOT tropical. Whats more, living in the United States, we have two coasts to choose from with a plethora of life forms to enjoy and study occupying them. Here well explore the basics of what it takes to have a local /coldwater system, including gear, set-up, livestocking, with special note re a popular goby. How are you going to know where youre going w/o a plan? I cant emphasize enough how important it is to study up, gather data, other folks input before starting actual purchase of gear with coldwater systems. IF your tank is not matched to the chiller, filtration, circulation, lighting you will fail. So, the place to start is what do you either want to keep species wise, or display/theme-wise and next, what do you want to do with them/it? Lets first talk about chillers: All cool to cold water set ups require a chilling mechanism. Even the largest volumes will drift too much thermally w/o a thermostatically controlled device to keep your water about the right temperature. For the majority of set-ups commercial chillers resemble and operate something like a home refrigerator, with a compressing pump pressurizing a coolant to make it convert from a gas to a liquid, an area allowing for expansion and hence cooling, and some heat exchanger providing for this loss of energy to transfer to the circulated system water itself. The last can include drop in coils that are inserted in tie-in sumps for the most part. And it should be briefly mentioned that there are other types of coolers, cooling that is employed at time, including ground/earth and other heat exchanger technology, as well as more technical gear. These other means are for either very large or quite small (a few tens of gallons) systems. Selecting a chiller is a straightforward proposition. Happily, in the age of the internet there are quite a few dependable websites and bulletin boards where you can query other actual users which makes, models theyve found to be of good use (reasonable purchase and operational cost, longevity); and all such manufacturers have readily available selection charts, often on the Net as well, that can be assessed to determine what size (in fractional/horsepower) youll need considering volume of the system and draw-down (the difference between likely highest ambient temperature and your desired system/tank water temperature). In actually picking out a chiller size, I encourage folks to get the next one up to give them a bit of operational margin, as well as provide for the very real possibility of their upgrading to a bigger volume system in future. Your chiller needs careful placement. Like your home fridge, the heat-dissipating coils of the unit need to be periodically vacuumed to remove accumulating dust, and some space needs to be left about the unit for air-circulation and the occasional need to perhaps get in around it, maybe even remove it for servicing. Do make sure and place the chiller near an electrical outlet w/ sufficient spare amperage, and be aware that some units produce noticeable sound when operating. To save money and discount condensation, either your tank should be especially thick-walled, or insulated. Early commercially made chilled aquatic systems incorporated a double-paned viewing (front) panel with a sealed in air space and purposeful desiccant (Calcium Chloride in some cases) to absorb the water vapor twixt the panels during construction. If you use just a stock set of specifications (strength only) you may well be disappointed in how easily moisture builds up on the outside panels, obscuring the view, wetting the surfaces underneath, and perhaps most disturbing, driving up your electrical bills from over-running your chiller. A regular tank can and should be insulated, and the top covered to prevent thermal leaking. A simple approach for the sides, back and bottom is to use a glue to attach cut sheeting of Styrofoam. These supplies are easily sourced at large hardware stores. Similarly, any sump/refugium employed should be covered. You may be fortunate to have relatively low humidity in your area much of the time, but if you find theres too much, too often a coating of condensation on the front viewing panel, siliconing in another in front of it/ with a small layer of CaCl2 at the bottom space may be worthwhile. Filtering coldwater systems should encompass brisk water movement, complete circulation, and a good deal of mechanical (particulate) screening. Ive kept large systems with just multiple hang on power filters, w/ and w/o skimmers, and using or not, any chemical filtrant/s whatsoever. Remember, the key with these systems is keeping them cold, not-overfeeding (which again is reduced with the temperature), and relying on good-sized water changes as the primary means of keeping water quality stable and optimized. Some commercial designs have utilized pressurized filter modules, but I really dont like these for the amount of labor involved keeping them clean, and the power/cost of running the pumps to squeeze the water through their media. Illuminating these systems does not need to be a major production like tropical reef systems. Better to utilize some sort of middle of the road boosted fluorescent technology than anything else that produces too much waste heat like metal halide, unless your system is more than a couple feet in water depth. A good idea to use timers to regulate photoperiod, and its fine to leave the lights on ten-twelve hours a day, given regularity. Many hobbyists, and even institutions located on the beach utilize synthetic water, vs. natural. They do this for convenience, greater longevity/use of the man-made product, and to reduce the likelihood of introducing unwanted critters, pathogens and pollutants. Alternatively, there are vendors of filtered natural seawater some that will deliver to your site, and places where folks can easily drive up and fill their containers with (sand/physical) filtered seawater for free. IF you opt for this latter approach, I STRONGLY encourage you to adopt a strict protocol of pre-treatment and storage of the water ahead of use. Some folks just place it in the dark for a couple weeks, decanting the water, leaving whatever mulm on the bottom to discard. Others utilize chlorine/bleach as a biocide, removing this a few days later w/ dechlorinator to assure they exclude unwanted biota. Amongst the challenges/joys of development as an aquarist is the exploration of different types of systems, biotopes and the life that can be kept in them. Coldwater systems should definitely be experienced; for their beauty, grace and potential learning. IF you live along a cool/er water coast, DO consider checking them out. There is some good to great news re stocking these systems and some not so great. The positive is that you can really load them up with life compared w/ tropical tanks. This greater latitude is due to reduced metabolic rates from depressed ambient temperature, as well as enhanced gas solubility in such settings. The negative mentioned is a matter of availability. There are a few specialty collectors (Quality Marine is an L.A. wholesaler who deals with these a bit) who provide wild-caught algae, invertebrates and fishes from the U.S. west coast. Hence, for the most part, folks are limited to what either they can collect (not hard to do w/ some minimal gear and licensing) or have other friends/aquarists/fishers gather for them. Macro-Algae: There are a couple of handfuls of local species Ive seen offered for sale in some shops in S. Cal.. Amongst the Greens (Chlorophytes) they include Codium (dead sailors fingers), which doesnt generally do well, and the more useful Ulva (shown below). Browns (Phaeophytes) involve a few Fucus/Fucales species (one shown), and Reds (Rhodophytes) abound as branching corallines (pictured) as well as very familiar encrusting forms. As with tropicals, much of useful algae will come with healthy local live rock, not requiring direct purchase. One last Cnidarian we should list is the Corallimorph, Corynactis californica; not only a darling of coastal public aquarium displays, but actually quite easy to keep and culture. Oh, and there is a bunch of other stinging-celled life off the coast, some of it, like jellies of various sorts, possibly showing up via strobilization off your life rock; but much of this has proven difficult to keep. In the brief space allotted, I would also like to mention the not-uncommon selling and keeping of two of our more common shark species, the California Horned Shark (Heterodontus francisci), and Leopard Shark (Triakis semifasciata). These and the one Moray off our coast, the Green/California, Gymnothorax mordax, are really animals for only the most experienced and dedicated of aquarists; requiring huge volumes and considerable expense in their keeping. Stocking is done as with any captive aquatic system; with preparation and testing to assure nitrogen cycling is complete, in steps not to overwhelm beneficial microbial populations. I start new systems near the high temperature-wise that Ill be keeping them to promote the process, and place some live rock (often with all organisms intact rather than removing macroalgae et al.) in three or four every two-three week interval steps to allow for die-off and large water change effects. The break in and livestocking steps entail a few months time; definitely more than warmer water set-ups, due to the reduced chemical/biological activity of lower temperature. Though too often sold as a tropical or even cool-water species, the Catalina Goby is decidedly cold water (50s to low 60s F.) species; living a much shortened, tenuous period if kept in warmer water. The Blue-Banded or Catalina Goby, Lythrypnus dalli (Gilbert 1860), is a real beauty with its brilliant red body and electric blue vertical lines. Its natural distribution is the two California (Baja, Mexico and U.S.) Pacific coasts. Because it is not a true tropical, it lives only a short while in water in the 70s F. Specimens collected in the summer months live a bit longer, but rarely more than a year. Burgreen, Warren W. 1972. An inexpensive cold water aquarium. Marine Aquarist 3(2):72. Ellis, Gerald R. 1982. Keeping temperate marines. FAMA 6/82. Glodek, Garrett S. 1990. Coldwater marine aquariums. FAMA 9,10/90. Goldstein, Robert J. 1992. Cold-water aquaria; making a big splash with consumers. Pet Age 4/92. Niesen, Thomas M. 1982. The Marine Biology Coloring Book. Harper & Row, Publishers, NY. Robertson, Graham C. 1975. Collecting and keeping temperate marines. Marine Aquarist 6(6):75. Wrobel, David J. 1987. 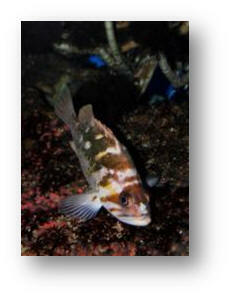 Keeping native marine fish in the home aquarium. FAMA 12/87. Wrobel, David. 1992. The temperate marine aquarium. TFH 6/92. Wrobel, David. 1992. Chilling your aquarium; how to control excessive water temperatures. AFM 12/92. and a yasha goby with its pet/worker slave shrimp to a 30 gallon Biocube with a variety of sps and Lps hard corals and an assortment of aggressive fish that were carefully introduced and have been doing "swimmingly" for a couple of years (a neon Dottyback, a yellowtail damsel and a falco Hawkfish all of which have their own territories and there are no squabbles (damsel high, hawk middle and dotty skulking along the ground and in various caves I've set up) even during feeding. So.....my question has nothing to do with the above humblebrag (which is really just to show I have some at least limited experience in your world). However, since then we have bought a 20 gallon coldwater marine setup as my wife and I have spent a fair amount of time on the Left Coast recently despite living in Florida and have seen how in the right hands a coldwater tank can be just as beautiful (or at least almost) as a typical tropical reef tank. anemone Actinia fragacea. The tank looks great although it's a little sparse as it will probably be 6 months to a year or more before the Corynactis colonies grow in sufficiently to cover the rockwork. a fluffy sculpin Oligocottus snyderii; a stout shrimp Heptacarpus brevirostris and a porcelain crab Petrolisthes eriomeris. So far everything is doing well and is fat and healthy except the plumose which refuses to come out in the daylight and a small spot prawn and previous Catalina Goby that was living in the tank with the other aforementioned fish. 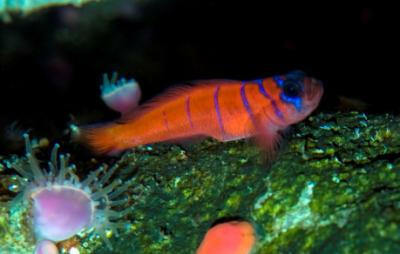 The other Catalina goby and small spot prawn were fat, eating well and both completely disappeared with no signs of illness, distress or aggression from other creatures. I assume they both dove head first into one of the true anemones despite the retailers assurance they "live with anemones and would never get caught". My dilemma and the reason for the extensive write up is that I would like to get more activity in the tank and miss the "free swimming" fish I have in most other tanks. The only true coldwater fish small enough for my tank are all bottom dwelling Sculpins and gobies or else incredibly rare in the trade micro filefish and small lump suckers that go for hundreds of dollars per fish. However, as I live in Florida I can't keep the "coldwater" tank at 50-55 like they do at public aquariums as the condensation becomes too much in an ordinary Florida home. So I keep it at a balmy for them 62 degrees and it hasn't seemed to noticeably affect anything (unless that's the reason for my plumose's shyness). Can you think of any small "tropical" fish that would be happy in 62 degrees AND not be stupid enough to dive head first in the nems? Thank you for the response. That's unfortunate as I would like something in the top and middle portions of the tank free-swimming. No but I will see if I can track some down and review. Thank you.